A winner at the Paducah AQS Quilt Show!! Broken Squares was awarded Third Place for Small Wall Quilts in the Longarm/Midarm Sewing Machine Quilted section. Jet Trails #6 has been selected by juror, Dan Mills, for Images 2010, the juried gallery exhibition of the Central Pennsylvania Festival of the Arts. The show will hang in the Robeson Gallery on the University Park campus of Penn State University from June 9 through July 11, 2010. 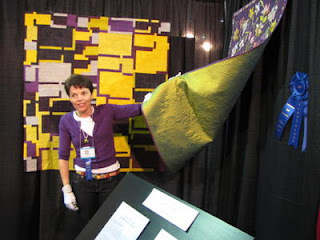 This is a picture of Deborah Kemball with her winning quilt at the IQF Spring Celebration show in Chicago as she shows the back of her quilt. My Yellow Brick Road quilt in the background did not win a ribbon, but it sure coordinates nicely with her sweater and her quilt! Congrats on your winning piece (guh, it's gorgeous) and on your selection for the Images 2010 show!! congratulations on the Paducah ribbon! good job! Congratulations on your win at Paducah and thanks for emailing me about my article!